A place for my reviews of stuff that does not fit in my other specialized blogs. I bought the older version because the image sensor has twice the pixels and uses them when taking pics to produce a 30 MP image which rivals anything I've seen so far under $700. First issue was just getting it. I found one for just $72 but they kept extending the ship date. I finally just cancelled and ordered from a different seller for $20 more. Next after getting it I found it would not work with my phone. I could swear that when I originally ordered it it said it worked with a Samsung Note 4 but after receiving it and finding it would not I went back and checked and only Note 5 and newer Samsungs were listed. To see if your phone is supported try installing the Samsung Gear 360 (New) app. But no worries there is a remote you can buy right? The Aobelieve Bluetooth Remote Shutter for Samsung Gear 360 2016 and 2017 Edition Camera which works well. For remotely pushing the record button anyway which is the main thing. It was $3 off with 2 day shipping so I went ahead and got it even before I saw what kind of pics I was going to get. While waiting on the remote I took a couple test shots to try out the software. Unfortunately like the Mokacam it appears you might not be able to get the software any more. The site you download software for Samsung cameras from has been down for a week at this point of this writing. The camera outputs photos and video in the dual fisheye format like the Mokacam 360. I gather if you have one of the few models this and the newer model cam are supposed to work with the phone converts (stitches) it to the postable standard equirectangular projection format the newer / better cams output. Googling I did not find a lot of options either. AutoPano has closed its doors so you can not even buy it though the site is still up. I looked on Alternatives. 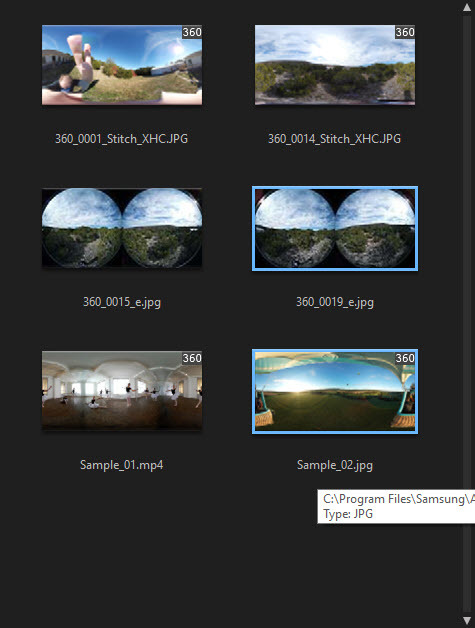 I tried a few but unfortunately most seem to want separate files they can stitch into a panorama, not a 360 sphere. PTGui is suppose to convert the dual fisheye directly. I downloaded the trial and tried several options but none came out right. Finally found a way to convert the photos at least. A free online service called nadirpatch.com. Though the seams are pretty obvious, if the angle is right you might hide them. See 360 photo album. So I still need a better solution or the camera is one step away from useless. In several places Samsung refers to the software as CyberLink ActionDirector so I went to CyberLink. 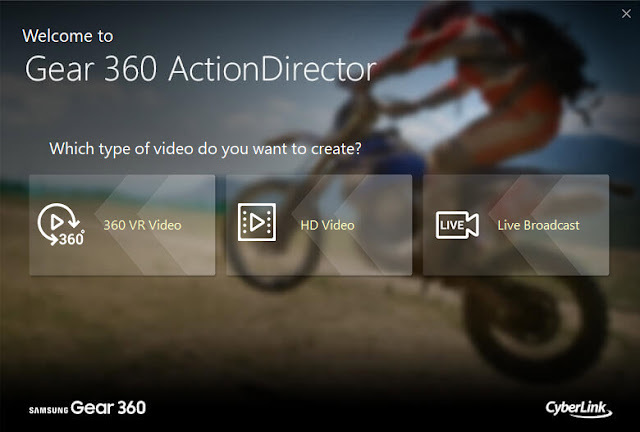 There it shows ActionDirector is for video and PhotoDirector is for photos so I downloaded a trial of that from them. (After having to create a new account before I could run the software because they seem to think my password changed at some point since 2011.) But again that does not seem to work with 360 files. So back I went for ActionDirector which seems to require an account to even download the trial. While it appears it is not the same as the Samsung version it does appear to be using it as a base. This video shows how you are supposed to use the Samsung version to convert / stitch the videos but the CyberLink version says the files are corrupt and will not even open them. This post shows how ActionDirector should also convert / stitch your photos as well but the CyberLink version just imports them as is. What is does seem to do is let you view them as 360 pics but with worse stitching than the nadirpatch.com option. Compare the screengrab here. With the nadirpatch.com stitched version on Flikr. And this still does not get you to something postable. I was about to just give up on this when I stumbled upon a post from 2010 in a CNet forum that says the hostname has changed to downloadcenter.samsung.com. This camera came out out in 2016 they were using the wrong host name for download links a good 6 years after it changed and they are still wrong today! This is the link to download the Samsung ActionDirector software. That let me import the pics but only if I have not edited them in Photoshop. As you can see here the 2 I increased the contrast on failed to convert on import though nadirpatch.com did. It is not obvious but ActionDirector converts on import and sticks them in the export directory. You need to right click on the files to open the folder to see them if you are not sure where that folder is. On the plus side the ones it converted do look better than when converted with nadirpatch.com. And I was able to convert some sample videos. Though the videos are not great. Full screen even on a 27 inch monitor they pretty pixelated. Especially when the cam is moving. But then like I said at the start I was mainly interested in the 30 MP photos since I was already disappointed in the video Kodak PIXPRO SP360 4K Dual Pro Pack VR Camera which was about twice the vertical and horizontal resolution of the Samsung. You will notice they both suffer from a shallow depth of field and focus fixed about 10 feet from the lens. The photo resolution and quality are pretty much the same though. The Kodak was $850 when I bought (and then returned) it back in 2016. It is going the $350 now. Which is what the Samsung was going for back in 2016. Labels: 360 cameras, Samsung Gear 360, Samsung.